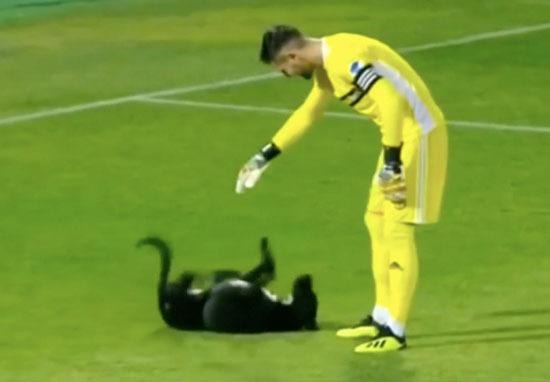 A playful dog invaded a football pitch in Georgia and was all too willing to roll over for a nice belly rub. The energetic black Labrador suddenly bounded on to the grass in the middle of a National Football League match, distracting the players as it ran around the pitch in Gori, Georgia. It’s not entirely clear where the dog came from, or how it came to be on the pitch, but it looked like it was having a great time. To be fair, from the dog’s point of view it probably just looked like the footballers were playing one giant, multi-player game of fetch with the ball. The good doggo just wanted to be involved. The cute Lab ran happily around the grass for about three minutes, wagging its tail as it looked for someone to play with. It first ran towards the referee, who was probably considering giving the dog a red card before deciding to let it carry on with the game for a bit longer. 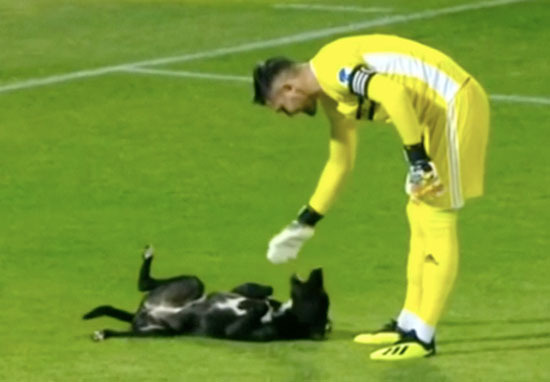 One of the teams’ goalkeepers managed to gain the dog’s trust by reaching out to pat it, and the friendly pup rolled on to its back ready to receive a well deserved belly rub. Two medics tried to remove the pitch invader and caught the dog by its front legs, but the determined animal wasn’t going to give up without a fight and managed to wiggle its way free. Another player got the dog’s attention and skipped along the side of the pitch with the dog following happily, jumping up at the footballer as if they were playing a game. Reaching the edge of the pitch, the player tried to lead the Labrador away, but the mischievous pup didn’t seem impressed with that idea and instead ran in the other direction. The dog was eventually directed off the pitch towards the stands, leaving the football players to get back to their game. Though it caused some disruption, I bet the footballers were secretly pleased about the short breather they got when the dog tried to join in the game. Plus, the score was 0-0 at the time, so I’m sure the furry pitch invader provided all the hopeful supporters with a bit of a pick-me-up. The dog was really just helping everybody out! 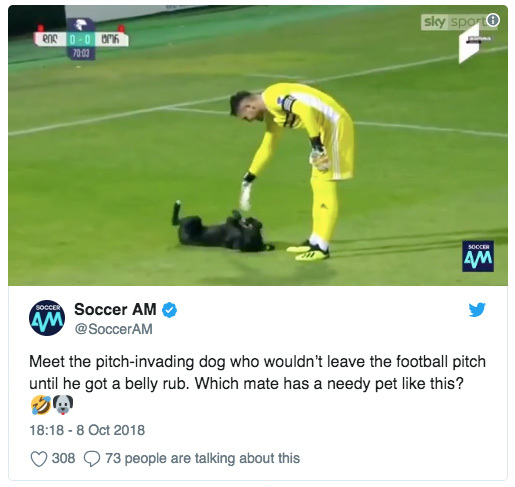 Meet the pitch-invading dog who wouldn’t leave the football pitch until he got a belly rub. Which mate has a needy pet like this? 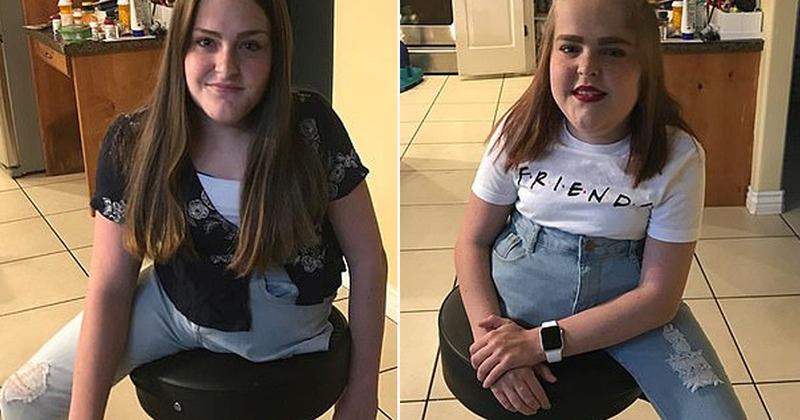 Many people took to social media to share the love for the playful Labrador. I’d be a lot more interested in football if this was a regular occurrence. I’d watch football a lot more often if this happened. That video made me laugh really hard. Cute and funny. I don’t think any future pitch invasions will be quite as cute as this one!